Demonstrate Brain Anatomy and Blood Flow. 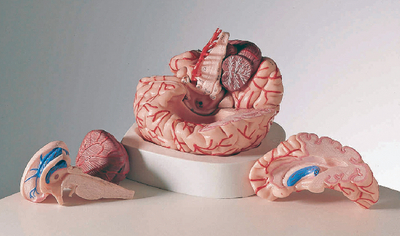 Ideal for demonstrating the anatomy of the brain and how blood is transferred to and throughout it, this life-size and realistic model can be studied both externally and internally for a thorough understanding of the structure and path of blood vessels. The model is sagittally sectioned with both halves separable into four parts: the frontal with parietal lobes, temporal with occipital lobes, brain stem, and cerebellum. The basilar artery is also removable. The nine-piece model rests in a base and can be removed for closer examination. It includes a key identifying 82 structures.